Kids&Koalas walker is exquisite and comfortable.It is also a real high-quality baby product, and every detail of our products have been carefully checked and designed. PP material panel,having no any harmful material. ABS material chassis,more stable and firm. Chrome-plated alloy frame,more firm and safe, bearing 30kg. TPR rubber wheels,is wearable, flexible ,quiet, and anti-scratch wooden floor. The PU cushion is soft and comfortable, suiting for seasons. It is easy to clean- when it is dirty, you just wipe it out using the wet cloth. Kids&Koalas baby walker folds flat for easy storage and travel. All products are free to install, and you can use it immediately when you get it. 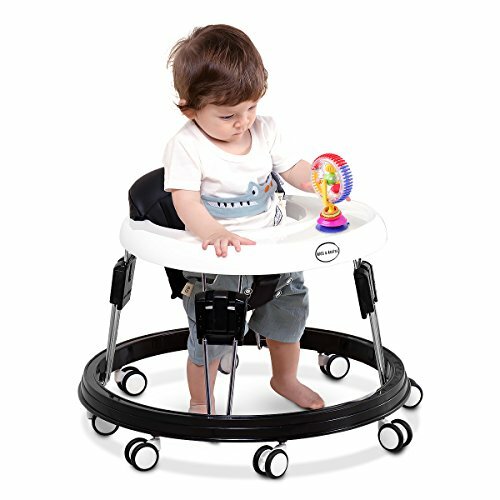 baby walker with 8 universal wheels and bigger chassis（the diameter is 24.4 inches),so it is anti-rollover, and the center of the gravity is also stable.It is absolutely safe! The perimeter of the seat hole is about 33.4 inches. The support sections have 3 gears to adjust the height, so the height of the walker is about14.17-16.53 inches. The cushion also have 3 gears to adjust the height, so the cushion height off the ground is about 7.87-11 inches, suiting for different height of babies. Suit for 7-17moths,27.7-33.8 inches height,at the same time, the max load for a baby is under 55lb. Free installation,folds flat for easy storage. Adjustable Height. 6 easy-to-adjust height positions suit for the growing baby. Large surround tray for food or toys.Extra wide base for superior stability and multi-directional wheels.The wheels are silent. High seat back provides additional support and comfort. Manufacturer: Myhoney Daily Products Co., Ltd. Publisher: Myhoney Daily Products Co., Ltd. Studio: Myhoney Daily Products Co., Ltd. If you have any questions about this product by Kids&Koalas, contact us by completing and submitting the form below. If you are looking for a specif part number, please include it with your message.